How Does One Pressure Test An Oil Cooler? Short of actually putting it on the car, how does one test an oil cooler to see if leaks? I have a few I want to sell but I want to know if they leak or not first. Se if they can't help you. Assuming they have already been cleaned inside you could pressurize them with 100 psi of air and submerge them in water and look for bubbles. You would need 2 modify 2 old oil cooler hose fittings. One to accept the air line connector and the other to act as a plug. It would be best if the Air Compressor had a Regulator to adjust the pressure down to 100 psi. you could use an old hydraulic jack...or even a FI Pop Tester pump.....and pipe it up with a pressure gage and a valve (pressure gage between cooler and valve) on one end and plug the other.....pump it up to 1.5 x working pressure......3++Bar is most likely somewhere between 45 and 60 psi.... so you would want to test between 65 and 90 psi......pressurize the cooler and shut the valve......wait awhile and see if the pressure drops off.....if the pressure remains stable for a half hour or so....you're good.....!! I would take it to a radiator shop and have them test it. If it leaks, have them fix it. A quick check if your household water has about 60 lbs pressure. Put a hose on the one fitting. Since you probably have an old oil cooler hose use it and close it off either by folding over the hose and using a clamp. Or installing a plug and clamp after cutting the hose. . The use of the old oil cooler lines allows you to quickly change from one oil cooler test to the next one. Take another old oil cooler hose and cut it. Install a fitting to hook up to a garden hose in the cut end. This will allow a test up to your available water pressure. It is better of course to take it higher to say a hundred pound test but probably good enough to spot a bad oil cooler. If the cooler drips it's an ebay item. Thanks for the ideas! My local radiator shop refuses to work on oil coolers because they say that they would "melt in their hands". When my car idles and the oil is cold I get 89 psi. The Oil Cooler should easily handle 100 psi of air pressure. Your Oil pressure gauge only goes to 3 bar but you have more oil pressure than that. You should not need to test at a higher pressure. Air molecule density is lower than oil molecule's = it leaks easier in a water test tank given any escape path (crack).. If it leaks out easier that would make the test with air even more conclusive. ForcedInjuction had told me that the oil pressure was over 100psi (I do not remember the exact figure but it is about the amount the the Oil Pump Relief Valve opens at) but I did not believe that. When I was looking for a place to tap in my Bypass Oil Filter system I drilled and tapped 2 holes through the top of my oil filter cap. 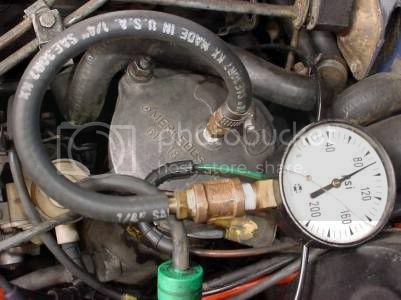 I installed a test pressure gauge and with a cold Engine my pressure was around 89 psi at idle. If I revved the Engine hot or cold the pressure went up to 97 psi but no higher. That 3 bar pressure gauge dose not reflect your maximum pressure at all. It is easy to check for yourself. Remove your Oil Filter Cap/Top and look inside to see where the casting webs are. Pick a spot where you do not drill through a web and drill and tap it for 1/8" pip plug; hook up your test up there gauge. "At operating temperature, oil pressure at idling speed may drop to 0.3 Bar gage pressure. Upon acceleration oil pressure should rise again immediately and attain at least 3 Bar gage pressure at 3000 /min"
Sorry, I was not trying to argue with Hunter. No matter what people say in the Forum it is always the judgement of the reader that matters. I found the Pic I took when I tested. Last edited by Diesel911; 08-25-2008 at 12:05 AM.